Twilight Time released and honored this film with this amazing Blu-ray that stands out as being something movie lovers should own. This is a wonderful crime drama thick with mystery in the classic style of cinema. The setting of this film takes place in the 1950’s. The setting is the Grand Canyon where a string of mysterious murders has taken place. The reality of a mining ghost town. Your main character Les Martin who is a deputy sheriff is being bombarded by the local community to solve the horrible murders, so beings the mystery that is Edge of Eternity. Starring a wonderful cast of performers. Your main star Cornel Wilde who plays Les Martin. In his amazing 77 years, he performed in over 70 performances. He starred in some of my favorite classic films such as, 1952’s The Greatest Show on Earth, 1965’s The Naked Prey, and many others. He was truly a talented actor that shined in his many films and appearances. Also, starring the beautiful Victoria Shaw. Shaw died way to soon. 53 years old was a tragic reality. Next in the starring reality of this film is the wonderful Mikey Shaughnessy. Shaughnessy was another gifted and amazing performer. Acting in some of my favorite films 1953’s From Here to Eternity, 1960’s The Adventures of Huckleberry Finn, 1961’s Pocketful of Miracles, 1962’s How the West was Won, and many others. I do have to mention this also has two wonderful characters in it. First the amazing Edgar Buchanan who performed in over 170 acting performances. Started acting in 1939 and did so all the way up to 1974. He was an amazing character actor performing in some of the greats of cinema. He starred in many of the films I love and return to often. The amazing 1940’s The Sea Hawk, 1943’s The Desperadoes, 1950’s Cheaper by the Dozen, 1951’s Rawhide, 1953’s Shane, 1963’s McLintock!, Many will remember him or know him from his long run on the Hopalong Cassidy TV series from 1952 to 1954 playing the character of Red Conners. He starred in many westerns. I think his character Judge Roy Bean in the 1956 TV series Judge Roy Bean is a prime example of his brilliance. Also, his reoccurring role of Uncle Joe Carson in Petticoat Junction and the TV series Green Acres from 1963 to 1970. His last starring performance was in the original and wonderful 1974’s Benji. He was truly a gifted character actor that expressed stardom. The second character actor this film is starring, is the ever wonderful, true character actor, side kick style of performance, Jack Elam. Elam has starred in so many films. He has acted in two other films that Twilight Time has released on Special Edition Blu-ray’s. Support Your Local Sheriff (1969) / Support Your Local Gunfighter (1971), Elam stars in both films. Elam not only was a perfect character actor, he was the definition of Western, or bad guy, or just plain character actor. Elam had that unique face you could not forget, mainly due to his cross eye. He most always played bad guys, killers and demented souls causing havoc in some form. To me there are very few Elam’s in cinema. Very few performers obtain the brilliance and destructive nature of character that Elam could do in his vast career of over 200 performances of TV and feature films. I still get a little teary eyed when I think he is no longer with us. He was so much of Hollywood. He gave the cinema lover, cinema world, perfection in his roles no matter how small or big they were, he owned and operated that role to a believable perfection. This is directed by a film legend Don Siegel. The story and film is adapted from the book Flaming Star by Clair Huffaker. Now I feel Siegel needs no introduction when it comes to film. If one calls themselves a movie buff, then you should know this director who created some of the most memorable films in cinema such as the classic Dirty Harry (1971) which might I add is one of the greatest films. We need to look farther back to the 50’s and speak of the ultimate black and white sci-fi classic and all around amazing and freaky film, the original The Invasion of the Body Snatchers. His direction and vision of Body Snatchers still lingers today as being something so amazing for its time and even impresses today. A little trivia in the 1978 remake of Invasion of the Body Snatchers, Siegel makes a cameo as the taxi driver pod person. Invasion of the Body Snatchers should showcase his talent to you, if for some reason, you don’t know who he is. He would also become the man that directed the legend of film Clint Eastwood in many films from Dirty Harry to Coogan’s Bluff, Two Mules for Sister Sara, The Beguiled, and Escape from Alcatraz. Now this friendship would last and on a little trivia note, Siegel can be seen in a cameo appearance in Clint Eastwood’s Play Misty for Me as the bar tender. I think what made Siegel such a gifted and different type of director is he directed just about anything and everything from documentaries, TV shows, TV movies, films and so on. He was a master, versatile director that owned the lens and all those creating the film with his ultimate perfection and Edge of Eternity is no different. 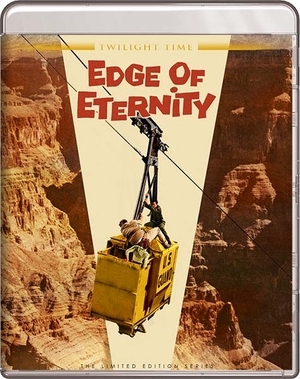 Edge of Eternity is one of his achievements in film. Edge of Eternity is one of those fantastic films that I feel you remember after it’s over. One reason is the ultimate fight on a U.S. Guano cable car which is suspended above the Grand Canyon adding that edge of your seat thrills. Another prime example of how to treat a film. A wonderful transfer to 1080p High Definition. The colors are vibrant, imagery is crisp. The sound quality is spot on. A perfect special edition Blu-ray in both audio and video. Isolated Music Track: The music is done by composer and conductor Daniele Amfitheatrof. A unique composer, a Russian born. Italian raised. Started composing in 1934 and did so up into 1960’s. He seemed to retire. His music was used on soundtracks up to 1985. A very intense and unique music master that sadly I feel has been lost by time and is often forgotten about and overlooked. I personally feel Daniele Amfitheatrof is a master talented musician should be remembered. Thankfully companies like Twilight Time has honored this music genius with this special feature. Audio Commentary with Film Historians C. Courtney Joyner and Nick Redman. A wonderful listen. A solid listen of knowledge in the cinema reality of a film that I feel is a wonderful example to experience and remember and thankfully because Twilight Time has honored this film with this lovely Special Edition Blu-ray. Yet again a priceless example of a blu-ray by a wonderful company that treats film with flawless degree of excellence. Another wonderful watch in a high quality transfer. Highly Recommended.